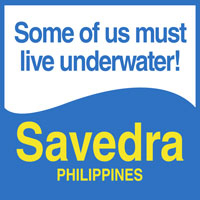 Explore the Philippines with Savedra Dive Center! 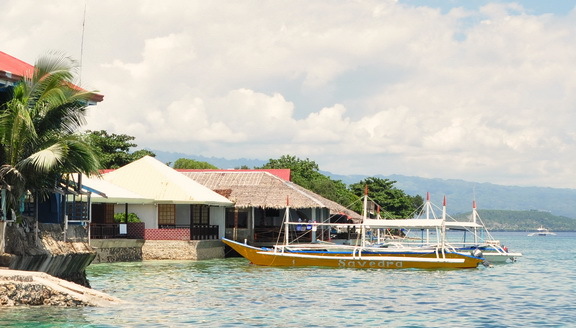 Savedra Dive Center is a spacious and modern Dive Center for scuba diving, PADI dive courses, beach resort accommodation, dive safaris, dive travel and just plain fun diving in Cebu in the Philippines. This website provides the most comprehensive guide available to diving activities, PADI courses, PADI Tec Rec Courses, Wreck Diving, Sharks and WhaleSharks, Beach Resorts and Outdoor activities in and around Moalboal. Our professional training department Seven Seas Dive Academy can even make you a PADI Dive Instructor! Simply lean back and surf through our website, enjoy colorful picture galleries, vivid underwater videos and select all the information you need for your next dive holidays. If you like what you see, let our in-house travel desk arrange your domestic flights, transfers, accommodation and diving activities. Tell us what you would like to do and when, we’ll take care of the rest. Scuba diving with Savedra is easy, fun and safe. 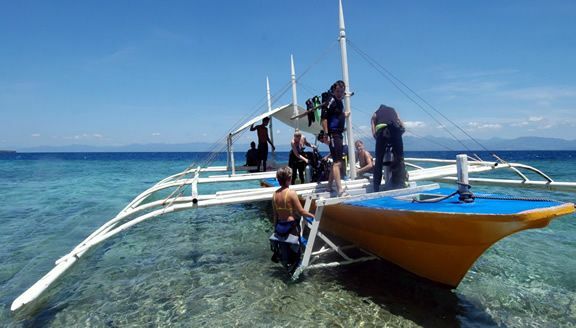 Join our daily boat and fun dive activities. Everybody is welcome, beginners and expert divers alike. If you are technical diver, a freediver or if you want to become a professional diver, you have come to the right place. 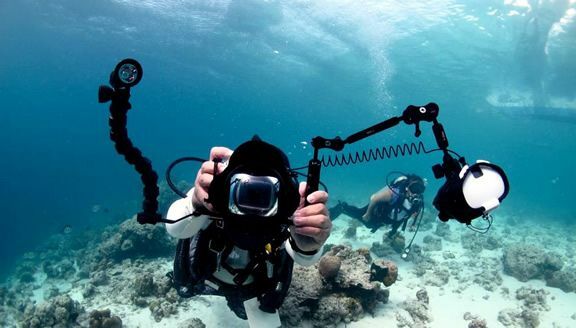 Underwater Photography – have fun taking pictures underwater! Taking pictures while scuba diving is extremely fun and rewarding. Share your scuba images with friends and family, print them as posters for your home decoration or show them off in the internet. 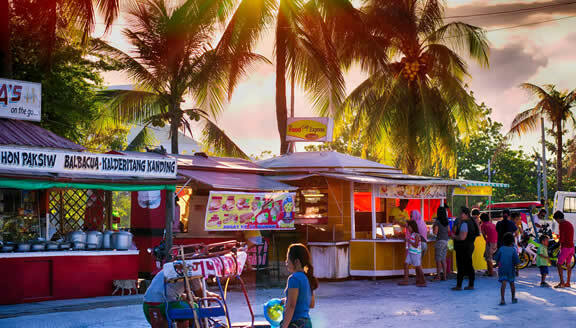 Island Hopping around the islands of Cebu, Bohol and Negros – sample the best the Philippines has to offer. If you want to see the best dive spots of the region in a short time or if you just want to enjoy cruising through the Philippine archipelago, a dive safari is the way to go. On a 6-day dive safari you tour from one tropical island to the next during the day while diving the best dive sites and stay in a comfortable beach resorts during the night. 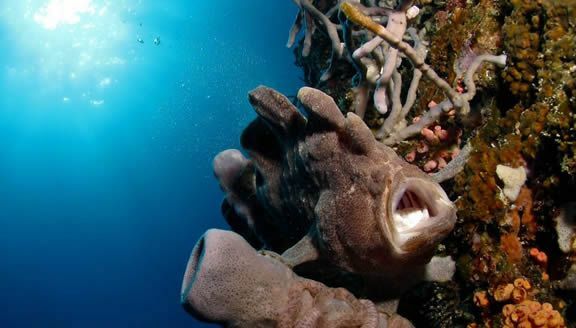 6-Day Dive Safaris run weekly from October to May every year. 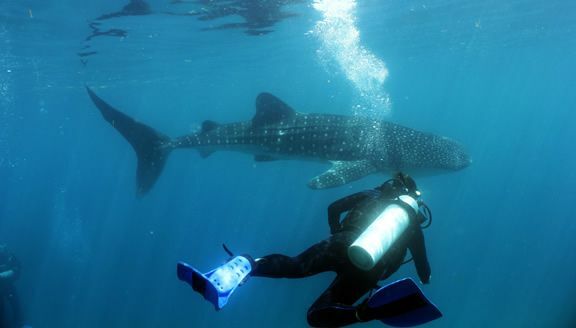 2-Day Dive Safaris trips can be arranged on demand and short notice. ALL ABOUT DIVE SAFARIS HERE! The Philippines is an archipelago consisting of 7107 islands (at high tide), located east of Vietnam and north of Sabah and Borneo, full of natural wonders and inhabited by joyful people the Philippines is located dead center of the coral triangle, the most ecologically diverse part of the worlds oceans, it has the highest coral diversity in the world. The Coral Triangle has more coral reef fish diversity than anywhere else on the planet, 235 species of the coral reef fishes in the Coral Triangle are endemic or locally restricted species. Six of the world’s seven marine turtle species, including the leatherback marine turtle live here, we also get visits from the blue whale, the largest animal to ever live on Earth. We could tell you more but you might think we were bragging. Here is some background information on the Philippines and on some of the friendliest people in the world. 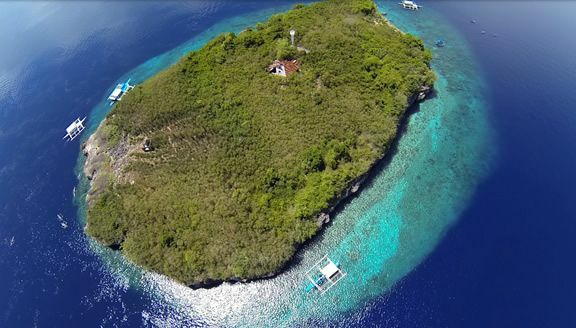 Cebu, the queen of the Visayas, consists of 167 islands and islets, next to the main island of Cebu itself. 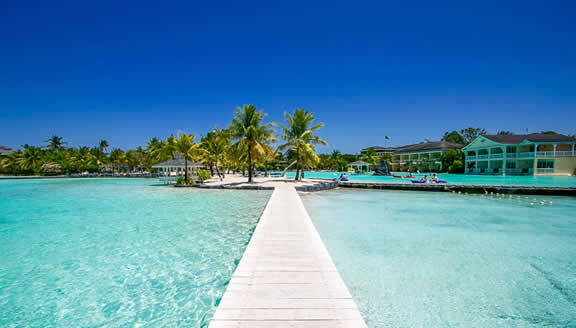 It has a rich history, ranging from the demise of Portuguese explorer Ferdinand Magellan, to its role in 2nd World War and now being home of many affluent beach resorts and the main center of commerce, education and tourism. 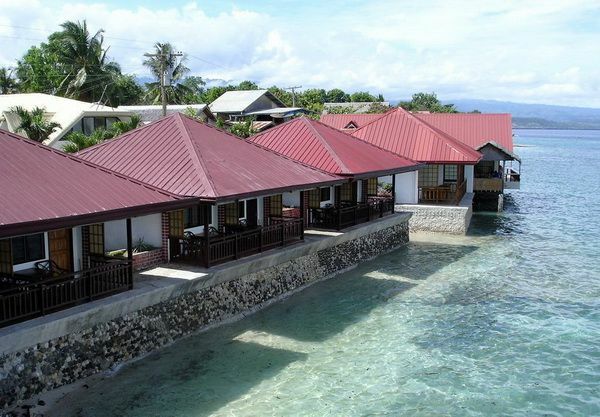 We have a selection of beach resorts, hotels and backpacker lodges very close to the dive center. Walking distance is usually less than a minute. We can provide package deals with transfers, accommodation and dive packages or dive courses, all arranged by us with one point of contact and payment, it couldn’t be easier. If you need a room we can arrange your accommodation at several beach resorts and hostels less than a minutes walk from the dive shop. Savedra Beach Bungalows feature fantastic sea views, Cabana Beach Club Resort is only a few steps away and has a private garden and beach and Marina Village Beach Resort is just behind the dive center. As a PADI 5 Star IDC Dive Center and accredited Tec Rec Technical Dive Center we offer dive courses for everybody and all experience levels. We provide you with the most up to date teaching materials and methodologies, the majority of our courses have an option to study online before you arrive, making the most of your precious vacation time. 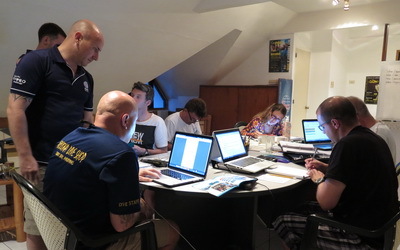 Our teaching staff comprises of two PADI Course Directors, IDC Staff Instructors, Technical Instructors, Instructor Trainers and Master Instructors, we develop and train our own staff. We do not know of anywhere else in the region where you can find this much knowledge and experience available to you under one roof. If you’re looking for new dive adventures to improve your scuba skills, gain more confidence and meet more dive buddies, you’ve come to the right place. Choose from a wide range of PADI scuba certification courses with flexible study options including online courses to accommodate your busy schedule. As a PADI Diver, you carry the most respected and sought after scuba credentials in the world. No matter where you choose to dive, your PADI certification card will be recognized and accepted. PADI Dive Courses are conducted at our Scuba Academy inside Savedra Dive Center, these classrooms are designed with Scuba courses in mind. 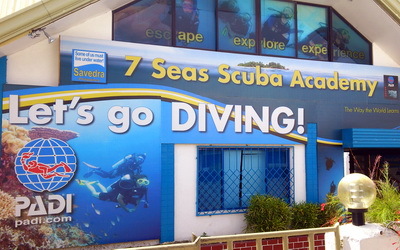 The Scuba Academy is the hub of dive education in the region. Beginner and advanced courses are conducted here. The location is ideal, the academy is located right in the heart of the beach, in-water training sites like swimming pools and open water training sites only a few steps away from the class rooms. Learning scuba diving can’t be easier. Our modern facilities provide you with everything required for a pleasant experience and the perfect learning environment. Our purpose built classrooms will be your base for the duration of your dive course, our international and multi-lingual staff will always be there to help you reach your goals. 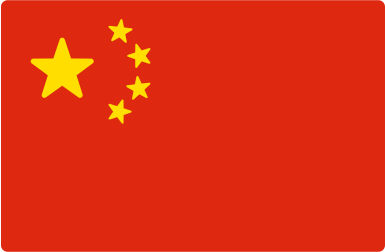 Your learning materials are available in a variety of languages and formats, like e-Learning, online manuals or Touch products which are designed for smart phones and tablets. Some of your in-water training dives are conducted in nearby swimming pools but most of your time is spent in the open sea. Our house reef has a shallow part perfectly with easy access suited for save confined water training dives, the adjacent wall dropping to 50+ meters is a heaven for deeper training dives. All this within a few steps from the dive center. 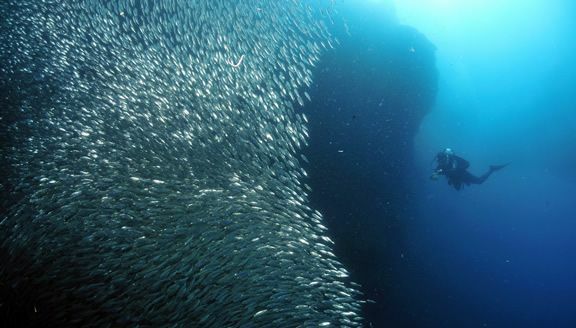 And, on top of it, the giant school of sardines is just a short swim away and will be encountered on many of your training dives. When one tank is just not enough, we must live underwater! Scuba Reviews: We Love our Divers, And They Love Us. Some of us must live under water! This is our motto and we live the scuba diving life style full time. 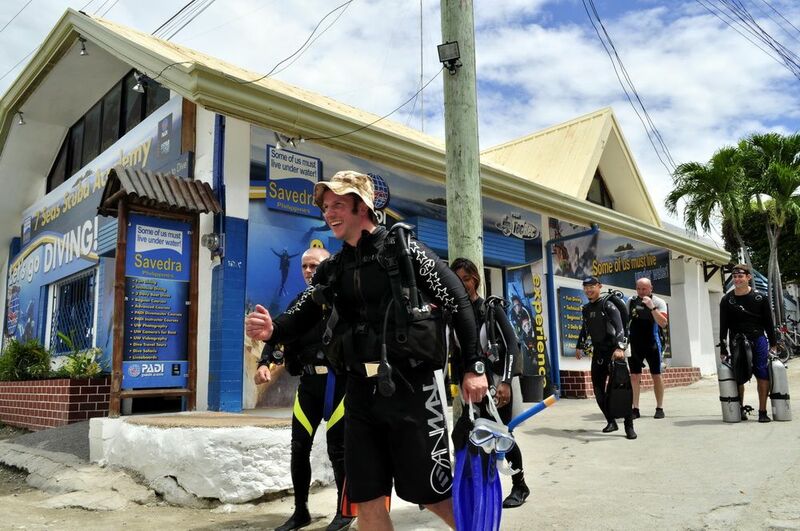 We are passionate about scuba diving and fully dedicated to our visiting fellow divers. This is why, when you book your dive holiday or dive course with us, there is no need to worry about quality or safety issues. Check out what some of our divers are saying about Savedra Dive Center and the 7 Seas Scuba Academy on Tripadvisor. Extremely kind and friendly staff and very professional. My own regulator began to leak, but the faulty o ring was changed between dives without charge. I had 9 dives there, most of them with the local divemasteren Beth, who is a master of spotting clownfish. Savedra is definitely a place I want to come back to. The staff did an excellent job with a refresher dive and took great care of me on my other dives. A skills review at the shop, followed by a short reef dive. If you haven’t been in a while this is a great place to jump back in. If you are a regular diver this is also a great place with a nice mix of friendly people and staff. I’m already planning another trip. They will set up your gear correctly as well as treat it with respect and do everything they can to help you have a great time. The staff has a GREAT sense of humor and will do everything within there power to accommodate your every request. The school of sardines, about a million strong! It was a surreal experience! You’d have to wonder why these sardines chose this spot. Watching them is incredibly hallucinating. It’s like watching a blob of mystic fluid making forms and shapes. It’s incredibly wonderful! A sight to behold! I had a blast of executing few cave diving trips with diving pros at Savedra. We dived two very different caves. First was a freshwater cave of Balamban few hours drive up north and second one was seacave of Kasai just 10min both ride away. I had awesome time and can recommend Savedra and Lee Butler to anyone who likes challenging cave and technical diving. More pictures and stories about these dive visit facebook.com/expeditiondivers. I Really Need To Dive, Please Send Me Info Now!